DMR Carpet Wrap Self-adhesive floor covering to protect during operation. Self-adhesive floor covering to protect during operation. Film is wound adhesive-side in on heavy duty 3 inch cores and is perforated every 21 inches. 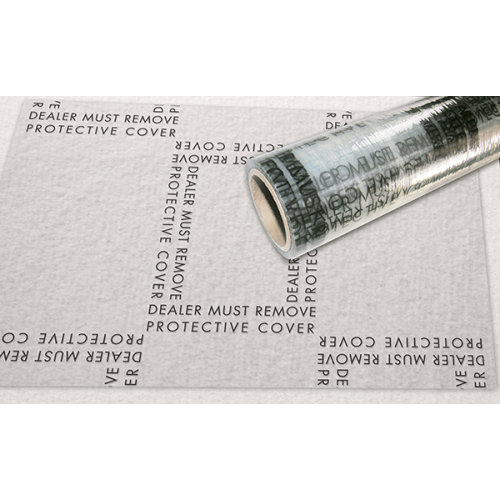 DMR Automotive Carpet Wrap from Barrier Films enhances your image and protects your vehicles' carpeting with ultra-tough polyethylene that grips the surface to keep all dirt and contaminates out. Printed with "Dealer Must Remove Protective Cover" in the industry standard rectangular pattern. Film is wound adhesive-side in on heavy duty 3 inch cores and is perforated every 21 inches. Perfect for protecting carpeting during demos, transport, body work, or virtually any display to give used cars a new car look and feel. 45 days.